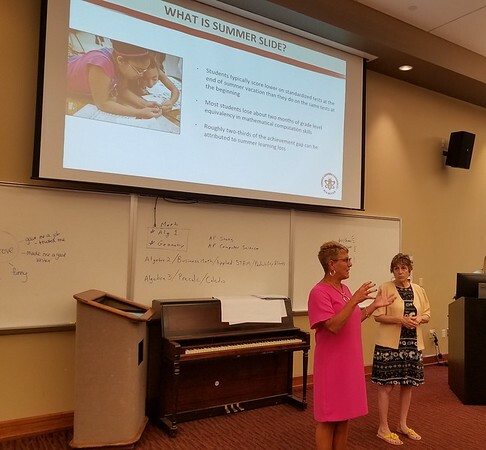 NEW BRITAIN – Summer program sponsors visited New Britain High School on Wednesday for a discussion that highlighted the importance, growth and effectiveness of these programs for students. Some of the sponsors that attended the event were the American Savings Foundation, the Community Foundation of Greater New Britain, United Way, and members of the Coalition for the New Britain’s Youth, among others. Superintendent of New Britain Schools Nancy Sarra and members of the Consolidated School District of New Britain hosted the visit. The programs that were feature are called CREATE (connecting real-world experiences & arts through education), XTREME (excellence through real-world experiences &maximizing energy) and SEE (summer enrichment experience). The programs started seven years ago and invitations to participate are sent mostly to students who do not perform well on standardized tests. This summer, there are 600 students in the SEE program, which combines literacy-based learning and enrichment activities. There are 160 students in the CREATE program, which focuses on hands-on activities in the areas of art. The CREATE program is new this year and is for students in the fourth and fifth grade. There are another 160 students involved in the XTREME program, in which students enhance their learning in the fields of science, technology, engineering and math (STEM). Sarra said that over the last seven years the school district has been measuring statistics and found out that students are attending the program successfully. She added that students will fall behind if the programs are not offered or if the students don’t participate in these enhancement and enrichment experiences. Because these summer programs are the efforts of a team, Sarra thanked the sponsors and the city for their work in helping transform the academic experience of children in the New Britain school system. “We are truly a city that is networked and I think that is truly the success of the program,” Sarra said. The summer programs run from July 23 through Aug. 10 from 8 a.m. to 4 p.m. at New Britain High School. The SEE program is held at DiLoreto, Gaffney and Lincoln schools. Meals and transportation are provided to students in the programs. Children from kindergarten through eighth grade can participate in the different summer programs. Registration is honored on a first-come, first-served basis and is free of cost. For more information about the programs visit the CSDNB website at . Posted in New Britain Herald, New Britain on Wednesday, 1 August 2018 20:25. Updated: Wednesday, 1 August 2018 20:28.